I became homeless after there were difficulties at home because I was struggling to get along with my parents. I was going out drinking and not even bothering to come home sometimes. Eventually my parents had had enough and they asked me to leave. SafeSpace helped me by giving me a roof over my head, finding me a flat, Helping me to learn to cook, Encouraging to keep in my job at the cricket club, there was always someone to listen to me and help me manage my money properly. Even though I have been moved on for 5 years now, SafeSpace have never failed to be there for help and advice when needed. It is with the advice of staff that i went back to college and I am now a volunteer at SafeSpace. I myself now hope to get into youth work so I can give others the chance I was given. If SafeSpace had not helped me I would have been sleeping on the streets and on my friends sofa’s and could easily have made some bad choices in life but because they did I am now the mother of a gorgeous little boy and have a wonderful partner, a 2 bedroomed house and I am getting along with my parents. I am actually part time carer for my mother. I have done several courses at college and I am starting my youth work course next month to compliment my voluntary work. I really didn’t want to move into SafeSpace, but had no other options at the time. At first I very much kept myself to myself. The greeting I got from Julie when moving into SafeSpace helped me a lot as I was shy and scared. SafeSpace have allowed me to stay here for 2 years and this has allowed me to understand who I am. I soon met the other members of the support team and they have been brilliant and helped to support me throughout my stay. I developed an excellent relationship with Stacey and she has given me great support to face all life’s challenges. I have enjoyed having staff around to offer me advice and guidance when it’s been much needed. Even if at times it’s has been just someone to talk at anytime of the day. I have also made good friends with other residents within SafeSpace, people who understand me. SafeSpace have helped me with my mental health and given me the support I have needed. I have also been given the opportunity to understand / education myself on different cultural and religious beliefs. I have been able to further my education within SafeSpace and have completed a number of projects such as Passport 2 Housing, Me Project, You Project, Princes Trust and my Child Care Level 1. I have also been able to get involved in a few activities such as Alton Towers, Eid Party, Homeless Games, Christmas Activities, Bonfire Trip and workshops such as sexual health & mental health. Even though I am moving on from SafeSpace I am happy to be receiving Resettlement support and am excited about my future. I believe if I hadn’t received the support of SafeSpace I wouldn’t be the person I am today! I ended up at Safespace because there was no room at my mums house for me to live. My Dad and his girlfriend would not have me living with them due to arguments regarding the other siblings not living there. I felt unloved, uncared for and worried about where I would end up next. I felt low and like my life was pointless as there was no one there for me. I went to the Young People’s Centre and they told me about Safespace and got me an interview that day. Support off the workers at Safespace helped me to get back on my feet career wise and home wise. I was surprised at the amount of support you actually received. At Safespace you can chat to the staff open and freely. I felt really comfortable speaking about my feeling and problems and felt they really helped. When I first moved into Safespace I was doing my Youth Achievement Award, the skills development worker helped me a lot by supporting me with this and also my AQA’s in Health and Hygiene, Taking Part in a Group Discussion and Employability Skills, which I received certificates in. I was also helped and supported in getting an apprenticeship in hairdressing, helping me find a work placement in a hairdressers as well as updating my CV and working on my interview skills. This has given me more confidence. My CV is now helpful as I am looking for work. The AQA’s look great on my CV. Everything has made me more determined to succeed. I currently have my own house and am looking at a few options at the moment which include work, college, university and travelling. At the moment I feel excited as new openings are occurring all the time. I feel happy and settled, also I am currently in the process of building relationships with my family. Within the next year I am hopefully either going to be working full time and doing college courses or at university doing media photography. I would also like to have been travelling. I would like to be in a position where I don’t need the support and would like to have lots more confidence that I am building at the moment. In a few years I see myself working for a national photographer or paper or having my own photography business. I couldn’t have got where I am now without the help of Safespace. It doesn’t bare thinking about where I would be now without the help from the staff. I was referred to SafeSpace by Pendle Housing Needs department. I found myself homeless following disagreements with my mum due to financial difficulties within the home. I moved into SafeSpace and I felt nervous but excited that I had somewhere to stay, I was moving on and getting some independence. SafeSpace have helped me by giving me somewhere to stay and giving me the opportunity to get in touch with the things I thought I had lost like sports and music. SafeSpace have also helped me develop life skills to help me when I live on my own. If SafeSpace had not helped me I think I would have gone down the wrong road. There were two paths and thankfully I took the right one. I am 18 years old and I was referred to SafeSpace by Housing Needs because I was homeless. I found myself homeless because of a breakdown in relationship with my mum as I wasn’t working or in education and my mum was finding it difficult financially. 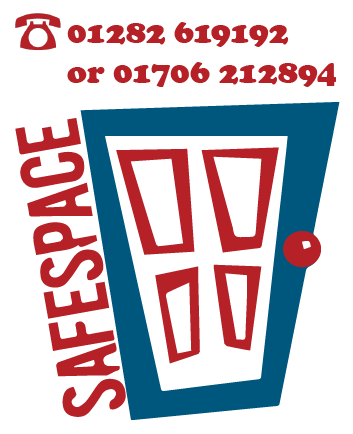 I moved into SafeSpace and I instantly felt relaxed, safe and hoped I would soon be able to get my own accommodation. SafeSpace have helped me by getting out of an area where I was having problems, learn more about how to budget and manage money, helped me find the right college course, helped me gain qualifications in cooking, outdoor education, independent living skills and helped me find a house which I am planning on moving into in the next 2 weeks. If SafeSpace had not helped me I could have ended up on the streets, ended up in trouble and associating with the wrong type of people and I would not have returned to education or gained any qualifications. But because they did I am now in full time education, have got my own house and driving at 90 miles an hour down the road of success!!!! !